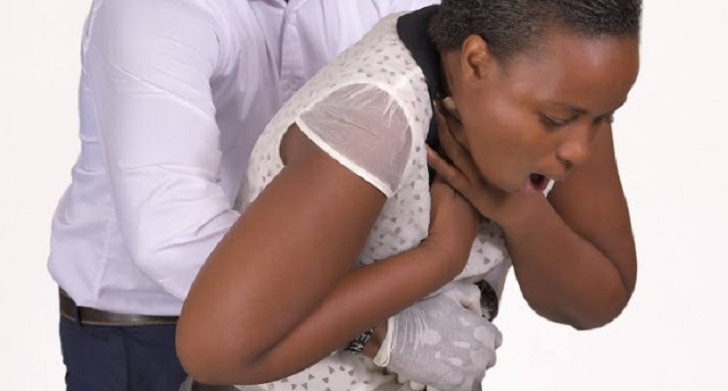 Choking is when your airway gets blocked and you can't breathe properly. When someone chokes, the airway can either be partly or fully blocked. If it's a mild blockage, they should be able to clear it themselves by coughing. If the airway is only partly blocked, the person will usually be able to speak, cry, cough or breathe. They will usually be able to clear the blockage themselves. To help with mild choking in an adult or child over one-year-old: Encourage the person to keep coughing to try and clear the blockage. If coughing doesn't work, start back blows. Stand behind the person and slightly to one side. Support their chest with one hand. Lean the person forward so that the object blocking their airway will come out of their mouth, rather than moving further down. Give up to five sharp blows between the person's shoulder blades with the heel of your hand. If not coming out, give up to five abdominal thrusts. Stand behind the person who is choking. Place your arms around their waist and bend them forward. Clench one fist and place it right above their belly button. Put the other hand on top of your fist and pull sharply inwards and upwards. Repeat this movement up to five times.